SBC Power Steering Bracket Ki t. Fits SBC engines with long water pump and 19319932 or 19319961 style power steering pump. Includes: pump bracket, instructions, and mounting hardware. Bracket isonly compatible with the listed pump style. Must use 1998-2002 Camaro LS1 power steering pump and pulley. Uses Truck (any year, or LS3 Camaro) crank pulley. Power Steering Pump Bracket Kit. Fits: all GM LS series engine blocks. Suggested power steering pump part # 63105. Includes: pump bracket, instructions, and mounting hardware. Small Block Chevy. Long Water Pump. Canister Type Pump. They can not have been assembled and disassembled. BBC Power Steering Bracket Ki t for Electric Water Pump. Fits BBC engines with electric water pump, must uselong water pump pulleys and 36P1435 style power steering pump. Made in Wichita, Kansas from aerospace grade, USA produced, billet aluminum. Trending at $47.70eBay determines this price through a machine learned model of the product's sale prices within the last 90 days. Includes: pump bracket, instructions, and mounting hardware. Small Block Chevy. Trending at $48.49eBay determines this price through a machine learned model of the product's sale prices within the last 90 days. LSFactory Truck Alternator & Power Steering PumpLocation Bracket. Includes: bracket, idler pulley, and mounting hardware. If needing to extend your alternator harness connection, use ICT# WEALT30-36 (4-pin) or WEALT40-36 (2-pin). ICT Billet. LS1 Camaro Power Steering Pump Bracket kit. Requires: 1998-02 LS1 Camaro (GTO any year) crank pulley (12553118). Mounts the power steering pump in factory 1998-02 Camaro location. Fits: all GM LS series engines. Fits SBC engines with electric water pump, must use Long water pump pulleys and 36P1435 style power steering pump. Includes: pump bracket, instructions, and mounting hardware. Bracket isonly compatible with the shown pump style. Uses the factory Saginaw Type 1 power steering pump used on truck engines. LS High Mount Power Steering Pump Bracket Kit. Fits: all LS series engines (must have compatible balancer pulley). Includes: bracket, idler pulley, and mounting hardware. Uses 1998-2002 Camaro LS1 power steering pump and pulley (truck p.s. pulley not compatible). Uses Truck (any year, or LS3 Camaro) crank pulley. Power Steering Pump Bracket Kit. Fits: all GM LS series engines. Corvette Power Steering Pump Bracket Kit. Requires: Corvette (any year LS) (or CTSV/G8/SS) crank pulley (12560115). Fits: all GM LS series engines. ICT Billet. No RMA numbers are needed. BBC Power Steering Bracket Ki t. Includes: pump bracket, instructions, and mounting hardware. Requires long water pump and 36P1435 style power steering pump. Bracket isonly compatible with the shown pump style. Trending at $44.30eBay determines this price through a machine learned model of the product's sale prices within the last 90 days. LT1 L83 L86 Alternator and Power Steering Pump Bracket Kit. 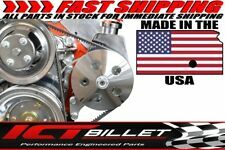 Will fit alternators from Gen 5 LT truck engines or any LS engineexcept Corvette. 145 & 160 amp truck alternators require aprox 3/4" longer belt. Block Chevy Billet Adjustable 551522. SBC POWER STEERING PUMP BRACKET Billet Adjustable LWP 350 Small Block Chevy. SBC Power Steering Pump Bracket 350 Small. Fits SBC engines with long water pump. Made in the USA from aerospace grade billet aluminum. Power Steering Hose Compression Coupler. Remove all those unnecessary bends in your factory hose. No RMA numbers are needed. Includes: pump bracket, instructions, and mounting hardware. Small Block Chevy. Long Water Pump. Canister Type Pump. 97-13 Corvette. Includes: power steering front support bracket (bolts to the front of the power steering pump, behind the pulley). - 98-02 Camaro, Trans Am, Formula, Firebird In Factory Location (mounted directly in front of the driver side head). Holden Commodore VZ 2005-2006. Pontiac GTO 2005-06 LS2 6.0. Includes all necessary bolts to mount the power steering pump to bracket, and the bracket to the head. Bolt Kit for GM Bracket # 92066673 Power Steering Pump. Pontiac G8 LS3 2008-09. Holden Commodore VE. Chevy Caprice 2011-13. Bolt Kit for GM Bracket # 92067625 Power Steering Bracket. Includes all necessary bolts to mount the pump to bracket, and bracket to the head. SBC POWER STEERING PUMP BRACKET Billet Adjustable LWP 350 Small Block Chevy 551522. Includes: pump bracket, instructions, and mounting hardware. Small Block Chevy. Long Water Pump. Billet Power Steering Pump Bracket. Includes: pump bracket, instructions, and mounting hardware. Small Block Chevy. Long Water Pump. Canister Type Pump. Billet Power Steering Pump Bracket. Includes: pump bracket, instructions, and mounting hardware. Small Block Chevy. Long Water Pump. Canister Type Pump. They can not have been assembled and disassembled. Billet Power Steering Pump Bracket. Big Block Chevy. Long Water Pump. Big Block Chevy. Long Water Pump. Why Buy From JandJ Ultra?. Big Block Chevy. Long Water Pump. All Electronics are for U.S. electrical system. Billet Power Steering Pump Bracket. - Big Block Chevy. Big Block Chevy. - Long Water Pump. Long Water Pump. Billet Power Steering Pump Bracket. - Includes: pump bracket, instructions, and mounting hardware. - Small Block Chevy. Includes: pump bracket, instructions, and mounting hardware. Small Block Chevy. - Long Water Pump. Mounts the power steering pump in factory location (in front of driver side head). 1998-2002 F-Body LS1 (2004-2006 GTO). This bracket kit is for use with truck or LS3 Camaro crank pulley. Billet Aluminum. Billet Power Steering Pump Bracket. Includes: pump bracket, instructions, and mounting hardware. Small Block Chevy. Long Water Pump. Canister Type Pump. In the case of factory defects, we will replace the product for you. LS Truck LS1 F-Body Power Steering & amp Accessory Brackets, Tensioner, Water Pump Spacer Kit, and Mounting Hardware. Uses LS1 F-Body Power Steering & Water Pump. Requires 1998-2002 F-body LS1 power steering pump and pulley (#63105 & #12559885).